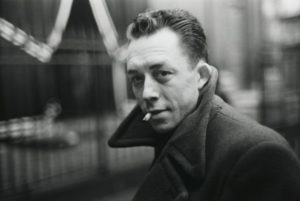 F I C T I O N I ran into Albert Camus the other day. (it’s my fiction, I can meet up with anyone I want). We were in front of Starbucks. Quoi de neuf? I hailed. Jesus, you go dark all the time. Lighten up, I replied. Come on Al. It doesn’t have to be like that. Are you working on anything new? Oy, you’re killing me with these quotes. You’re like a one-liner factory. Just tell me if you’re working on a new book. See, this is why everyone thinks of you as an existentialist. Enough! Are you seeing anyone? Can’t you ever be rational? Totally! I have always admired the way you are in touch with your inner self. That’s what I’m talking about. And you know what you like. That’s absurd. But then you’re absurd. Has anyone ever told you that? Right, right. Not like you’re some kind of fame whore or anything like that. Yeah, okay. Listen Al, it was great seeing you again. I know you’re still not speaking to Sartre but you know he thinks the world of you. Maybe it’s time you guys patched things up. Okey dokey. Good seeing you again. You take it easy. Or take it any way you can get it. F I C T I O N Johnny quit the band to get married and start law school. We played together for the last time at their wedding reception, and then loaded the guitars and headed west for California without him. Another friend from school had rented a big house in Portola Valley and he was eager to become the new drummer who could book us into the San Francisco music scene. We holed up to practice for two weeks, and then started playing the North Beach joints, including a few nights on stage with Carol Doda. The writing on the wall came after we cut the demo with Jim Lange in August. We listened to the playback and nobody, but nobody, thought there was a future. It’s a sad thing to see the dreams of artists dashed. The guys all drifted back to Houston, and I moved in with Bonnie. We met when the group was playing Sunday nights in the Marina District. The Annex was a happening weekend scene, and she had come to town from Seattle with flowers in her hair. One thing led to another, and then she’s telling me I’m going to be a parent. She said she had not been to the doctor yet but had missed two periods and was absolutely never ever late. I was more than a little concerned that they might kill me first, so after some discouraging looks at options, I proposed, she accepted, and we drove her Austin-Healy down to Monterey where her parents lived comfortably and did the right thing with a lavish, if sudden, noon wedding at their church. We were too young and stupid, and it turned out she wasn’t pregnant after all. What she was and continued to be was an actress, and a specialty model whose legs kept showing up in advertisements. She was doing a ton of local ads for the Bay Area papers, and that led to her working in Los Angeles, New York, Nice, and South America. I was spending a lot of my time alone and wondering about my pals back in Texas. Then I got the phone call I should have been expecting. Harpeth Rivers is a New Mexico transplant from all over who has in the last year written songs about isosceles triangles, played bass guitar in a band, and declared himself “Retro-eclectic.” His novel-in-progress is entitled Last Year. E S S A Y Here’s something to know about me at the start. I’m not a fan of guns and not knowledgeable about them. Gun, rifle, pistol, even an Uzi. It’s all pretty much the same to me. Up until the time of the incident at the shooting range I had never seen a gun up close, much less held one in my hand. It was a dreary Saturday afternoon in autumn, one of those days when you just want to eat hot soup and contemplate the coming winter. A young man of my acquaintance suggested to me that I ought to know how to handle a gun for my own protection. I doubted that. I immediately flashed on to a vision of a home intruder grabbing the weapon from my hands and turning its power on me. This is something I’ve read happens to inexperienced gun owners. Exactly why you need to use a gun, the young man said – so that sort of thing won’t happen. I could think of another way to prevent it from happening: keep the doors locked and guns out of my home. But I remained silent on that point. He was a young, twenty-something relative, eager to please, and I was pushing sixty, a guest in his home, and wanting to keep harmony in the family. Besides, as I said, it was a gloomy day with nothing much to do. We drove through a light rain to the shooting range, he chattering on about how I was going to love the feel of the gun in my hand, me mostly silent – no point arguing about it now. We were already launched on the mission. The range turned out to be a large metal building, rather forbidding looking. If there’d been any sun that day it probably would have reflected off the walls in a blinding glare. But as it was, the building just sort of loomed at the end of the road as we approached it. Once inside, I learned that I would have to read a handbook, see a short film, and then take a test on gun safety before I would be permitted to touch a weapon. I found that comforting. Good idea, I said, as the almost deafening sound of gunfire rattled around the tin can of a building. People were busy shooting all around me and I was glad to know they’d all passed the safety test. Or so I hoped. It turns out I was the threat. I passed the test but somehow didn’t get the message that I should not point the gun at people when I’m talking to them. Here’s how it went: First, I was surprised, when I actually had a gun in my hand, at how easy it is to shoot it. It takes a little effort to release the safety but once you’ve done that you can almost shoot the gun by just looking at it. Of course it doesn’t tell you that in the instructions. I guess they assume everyone knows. Second, when you’ve spent your life looking at people when you talk to them it’s a hard habit to break. The rule is, set the gun down before you turn around so you do not point it at someone. Not once but twice, I turned around from the target to talk to my companion, gun in hand and waving wildly to make my point, and he hit the ground in a very admirable, quick reaction. “Oops, sorry,” I said each time. But really, can you be expected to change a lifetime habit after just reading a little booklet? The young man looked pretty shook up after the first incident, and just plain tired after the second, so we called it a day. I didn’t shoot him, of course, but I’m startled all over again when I think how easily it could have happened. I rolled up my Osama bin Laden target (he was the villain of choice just then) and we left the shooting range. The sun had come out, our spirits were at least somewhat restored and, best of all, we were both alive.